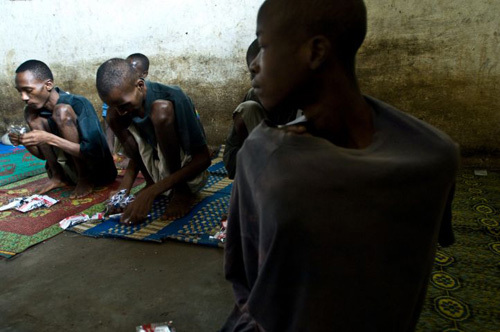 In September 2008, MSF began an emergency intervention in the civilian prison of Guéckédou in southeastern Republic of Guinea. Malnourished prisoners received therapeutic food to treat malnutrition provided by MSF at the Guéckédou civilian prison. 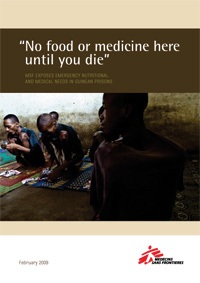 In September 2008, Médecins Sans Frontières (MSF) began an emergency intervention in the civilian prison of Guéckédou in southeastern Republic of Guinea. Upon arrival, MSF found malnutrition in one in three adult male prisoners, one in five of whom suffered from severe acute malnutrition. Appalling hygienic conditions had led to dehydration and rampant skin and respiratory infections. Overcrowded cells mixed both minors together with adults and prisoners with tuberculosis (TB) together with other inmates. Health care was only infrequently available. MSF responded to the situation in Guéckédou prison with emergency therapeutic food distribution for about three months. MSF also conducted medical consultations, donated medicines and provided material for water supply, sanitation and personal hygiene. MSF’s emergency intervention in Guéckédou prison raised concerns about the nutritional situation in other prisons in Guinea. Field teams therefore carried out assessments and conducted medical consultations where necessary, in three other prisons in Guinea—Mamou, Boké and Gaoual. Based on observations from our work in Guéckédou and beyond, MSF concludes that the appalling conditions observed in Guéckédou prison are unfortunately not an isolated case. Although conditions varied in different facilities, all prisons MSF visited failed to provide basic needs such as access to water, food and health care and to maintain minimum conditions respecting prisoners’ human dignity. These dire humanitarian needs demand an immediate response. Yet a short-term emergency intervention cannot be the solution to pervasive and more structural dysfunctions in penitentiary administration as regards food distribution and maintenance of hygiene conditions, impacting above all on adult male inmates. Deprivation of food, water, minimal living conditions and other basic needs is life-threatening and tantamount to ill-treatment of prisoners. "“We have problems with food and illness here. There are no medications. There is no doctor. Since 2007, 30 people have died here and the doctor didn’t come."